Honor Goodsite’s Big Build Competition 2018 winners announced! Following on from the Big Build’s success in 2017, the Considerate Constructors Scheme teamed up with CITB’s ‘Go Construct’ to make this year’s competition even bigger and better. This year’s competition saw many wonderful models ranging from giant, menacing robots to emergency relief shelters. 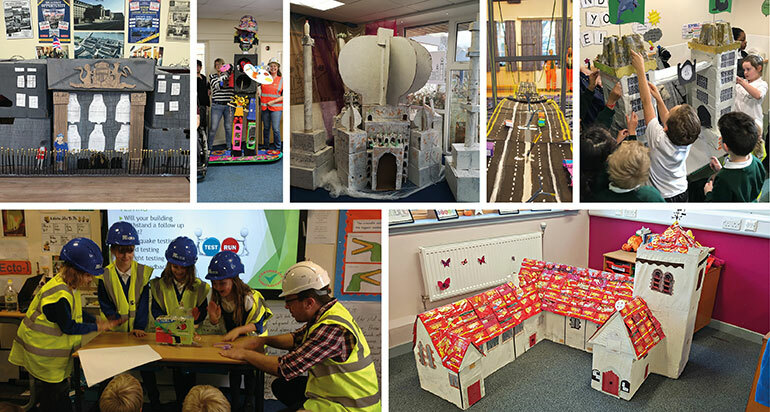 The Big Build has now seen a second successful year in a row with 40 entries and over 1000 children and adults taking part. Our team of judges, including Honor Goodsite herself, were left with the extremely difficult job of picking five winners. All of the participants truly took on board the essence of the competition with the children displaying great teamwork and contractors sharing their knowledge of environmental sustainability as well as teaching their community groups all about the construction industry. The Scheme is delighted to announce the winners of the Honor Goodsite’s Big Build Competition 2018. Click on the boxes below to read all about these fantastic builds. 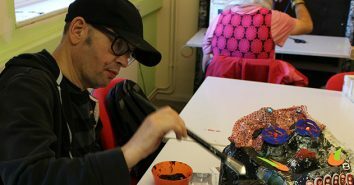 The Junk Art Group, supported by Willmott Dixon, looked to the future while drawing on cultural references from today to create Robbie the Robot from materials otherwise destined for landfill. Robbie has a ‘Lisa Simpson’ head, a ‘skirt ‘made from old Christmas decorations, a ‘Michael Jackson’ hand and a Tardis leg. He is also a representation of the five senses – for example, he is brightly coloured, is made from many materials and stands on a pallet covered in scratch and sniff cinnamon and chocolate paint. Overwhelmed by the response to this year’s competition Honor Goodsite would also like to give a special mention to two additional entries for going the extra mile. As a Structural Engineer herself, these entries stood out to Honor amongst the rest. 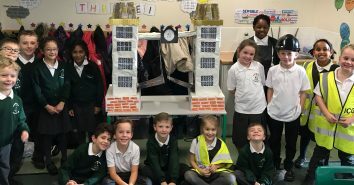 When it came to putting together their project for the Big Build, this school didn’t think big, it thought supersized and produced a realistic representation of the Humber Bridge measuring 1.8m wide and 11 metres long. Putting together a model of this size and scope called for the talents and help of many people. As well as the 40 children from the school, the team from Jackson Civil Engineering and even members of Halifax Council lent a hand on the day. 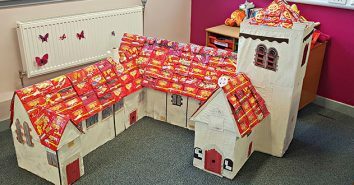 “Could you build a shelter during an emergency situation?” This was the challenge that Kier set to sixty Year 3 children from Parley First School. The team from Kier encouraged the children to begin their search for a solution, which the children then set about making real by constructing the shelters. They then had to test their shelters to ensure they could withstand an earthquake and high winds. Everyone proudly wore a hard hat and appropriate PPE for the session. Thank you to everyone who participated in this year’s Big Build competition and congratulations to every winner and runner-up. 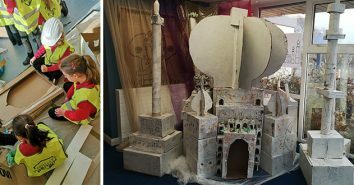 Communities and the local environment are often at the very heart of many building projects, and we are delighted to see how those registered with the Scheme are working with their local communities through the Big Build competition to create these fantastic pieces of artwork and engineering! 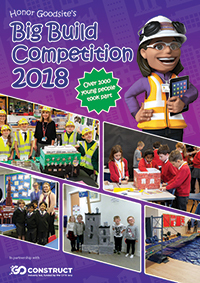 The Scheme is delighted to publish the 2018 Big Build Competition winners brochure celebrating all of the brilliant entries and photos from this year’s competition. 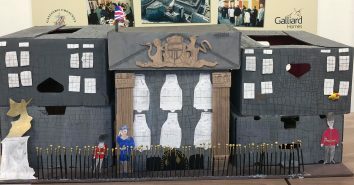 The Scheme would also like to thank and congratulate everyone who entered this year’s Big Build Competition. Without their hard work the competition would not be the success it has been.